Checkpoint 300, Bethlehem. Photo EAPPI/S. Amrad. Watch this short video from an EA about what it’s like at the checkpoint everyday. Check out our new photo album on the EAPPI website with photo resources about Checkpoints & Agricultural gates. ‘Arab ar Ramadin al Janubi is in the seam zone. Sandwiched between the green line and the wall, the village is isolated. 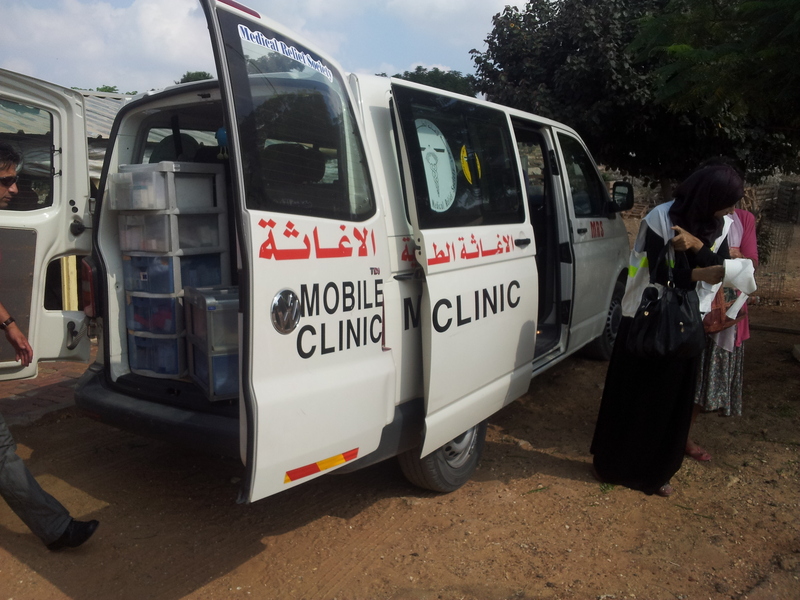 The car for the PMRS mobile clinic, loaded with medical supplies. Photo EAPPI/S. Skånberg. “Fine, let them build the wall. But do it on the green line,” Suhad says to me. Suhad works for the Palestinian Medical Relief Society (PMRS) which is an NGO that offers medical services for the most vulnerable people in Palestinian society. She says these words as we stand on the outskirts of the village ‘Arab ar Ramadin al Janubi, which is a village PMRS supplies medical services for. The reason is that the village is in the seam zone. In 20012, the Israeli goverment decided to build a wall between Israel and the West bank for security reasons. But due to illegal Israeli settlements in the West bank, the wall was built to keep as many of the settlements on the Israeli side of the wall. 85% of the wall is built on Palestinian land, thus creating an area between the “green line,” the internationally recognized border between Israel and Palestine, and the wall. This area is known as the seam zone. Those living in this area are still living in Palestinian territory, but are separated from the rest of the West Bank. Because’Arab ar Ramadin al Janubi is located in the seam zone, they are not able to build. Therefore, the new school they built has a stop working order on it, which means it will be demolished. The case on the school is in the Israeli court and is yet to be decided. I talked to Alam, the head mistress in the school. She previously worked as a teacher in Hablas, a village in the West Bank that is not in the seam zone. “What is the biggest difference to work here compared to Hablas?” I ask. To cross a checkpoint in the wall, you need to apply for a permit for a specific checkpoint. You either need to have land or a job on the other side of the wall. Many people are rejected. Alam tells me there is problem for her and the teachers at the checkpoints. It can be problems related to permits, but mostly it takes a long time to stand in the queue to pass. “How are the children affected by the occupation?” I ask. Always when I ask questions like this I feel embarrassed because it is so obvious the children here can’t live a normal life. Still, I want to hear the people living under Israeli occupation describe it themselves. A boy running off to class. Photo EAPPI/S. Skånberg. She tells me that they can’t go to school trips like normal school children. 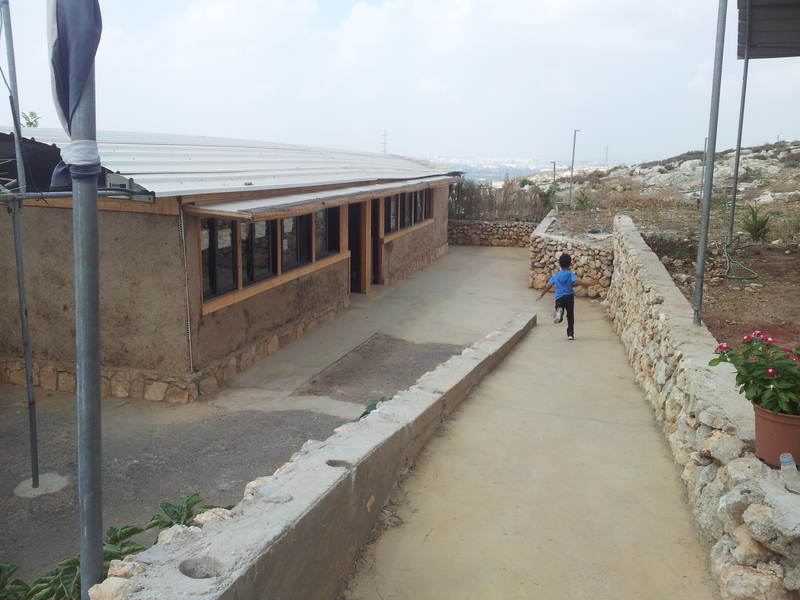 The school must coordinate with the Israeli authorities to get books to the school. It is also hard when the children will be vaccinated because they have to pass the checkpoint and go in to other parts of the West Bank. Suhad and I take a tour in the school and greets the children. When Suhad asks if they are happy to be back in school, they smile and say yes. “Because it will help us to become adults and be educated,” a little girl replies. Suhad pointing at the nearby settlement. Photo EAPPI/S. Skånberg. After our school visit Suhad and I take a walk around the village. 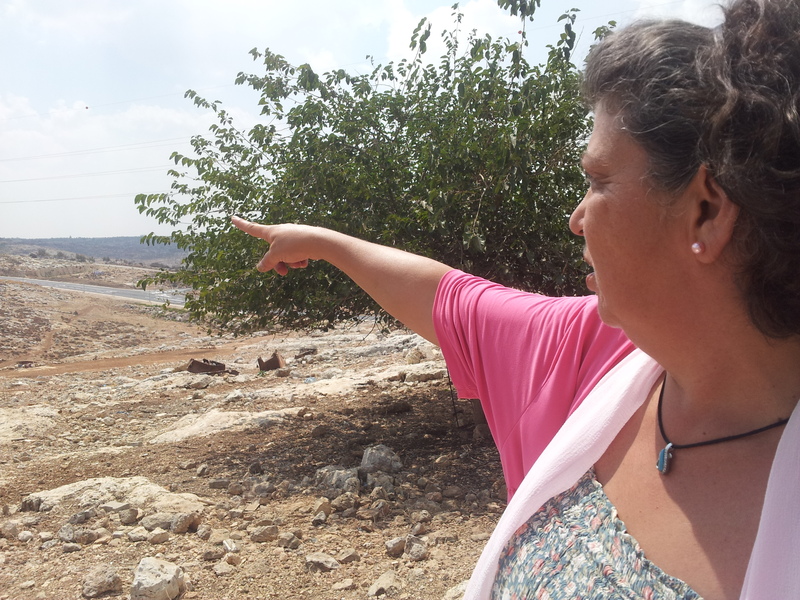 She points to the Israeli settlement on a hill not too far away. This settlement is the reason that the wall is dividing this village and others from the rest of the West Bank. She tells me that her father used to be a farmer and have land. He used to export fruit to Kuwait and other countries, then only to Jordan, then selling only locally in the West Bank and now the land is behind the wall so he can’t use it. Once again I feel embarrassed for my question but I ask it anyway. “What do you think is the first step towards peace?” I ask. 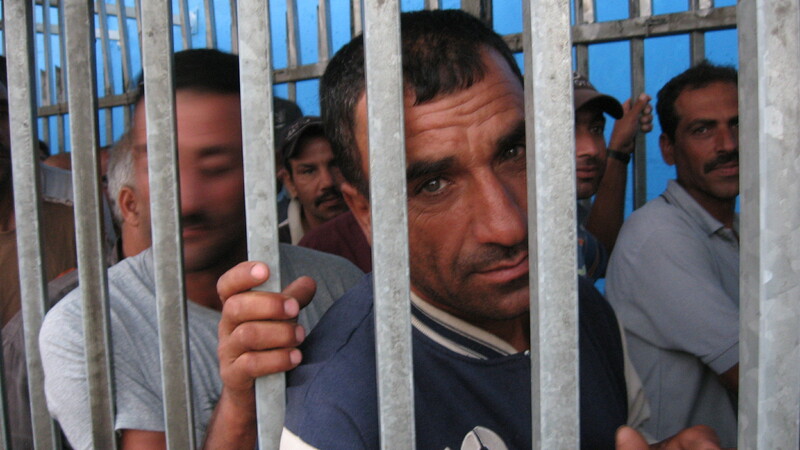 *Read about how life is dramatically different in ‘Arab ar Ramadin al Janubi from the nearby settlement, Alfe Menashe. 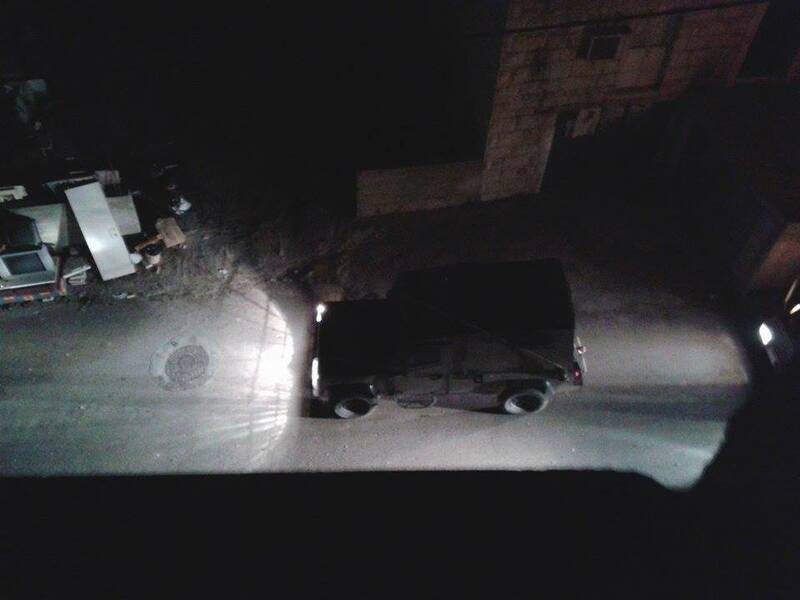 What fuels the clashes in Hebron? For several months, daily clashes between Palestinian teenage boys and Israeli soldiers around two crucial checkpoints have occurred in Hebron. Due to the frequency of these clashes they are referred to by locals as “a phenomenon”. But we are also reminded that the context in which these clashes occur are tied to the social impact of life in a separated city. Where do the clashes occur? Each morning and afternoon, as the boys make their way to and from school, clashes occur. A few boys gather. A military jeep, filled with soldiers, rolls up. One stone is thrown toward checkpoint 29 or 209. More boys arrive and chanting starts. Soldiers begin to shift uneasily in their boots. A shower of stones reaches the military men. A tear gas canister is fired toward the boys. White smoke fills the tense air as people pull their shirts over their mouths and run to escape the gas. There are a few minutes of calm. Then it starts again. Stones met with stun grenades and tear gas; unequal weapons in a complicated clash. 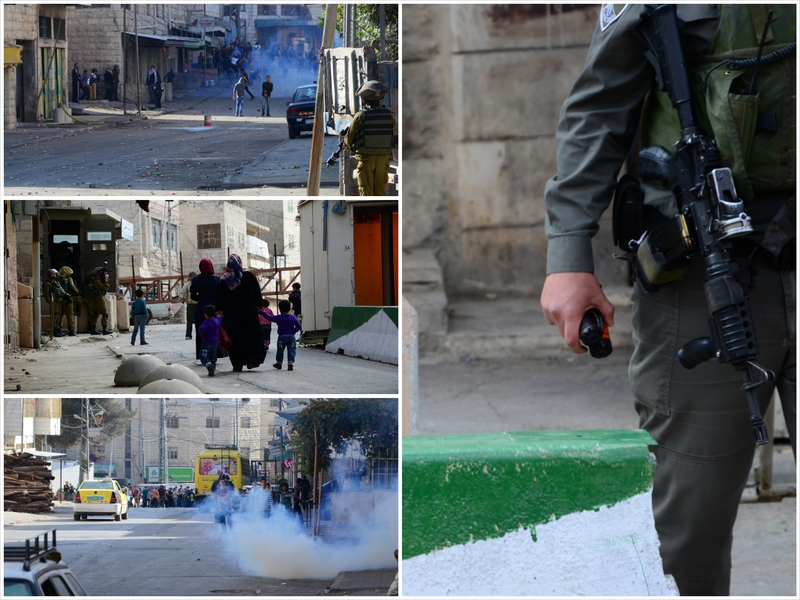 Images of everyday life at checkpoints 209 and 29 where clashes occur daily. Photo EAPPI/M. Knoblauch. This is Hebron, a microcosm of the occupation. Palestinians, Israeli settlers, soldiers, police, and border police converge in a split city. After the Oslo Accords, the city of Hebron was divided into the Palestinian controlled H1 and the Israeli controlled H2. 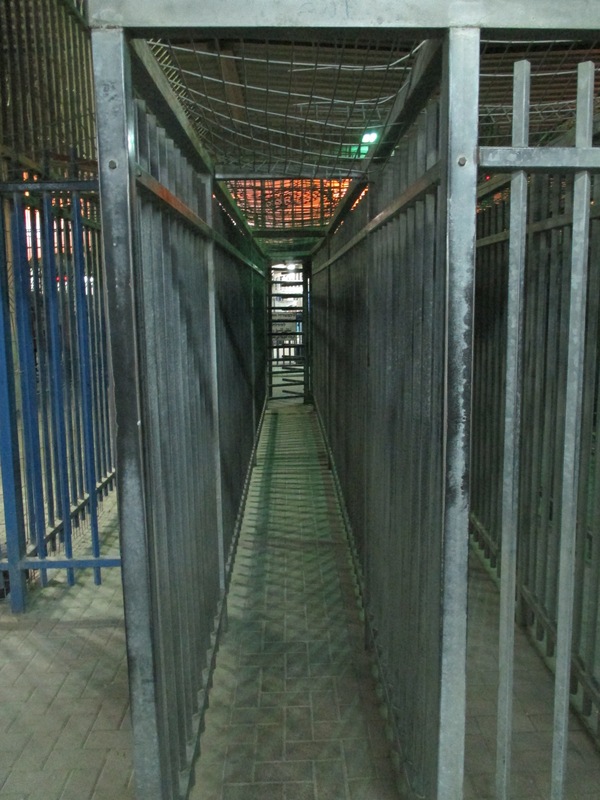 18 permanently staffed military checkpoints and 120 physical obstacles are strategically placed around the H2 area; monitoring, restricting, and checking the Palestinian people. Two such checkpoints are 29 and 209. These checkpoints are approximately 300m apart and are manned by the Israeli border police with assistance from the Israeli military. In recent months, the area between these checkpoints has experienced what has been described by local Palestinians as a “phenomenon”; violent clashes occurring sometimes twice a day between school boys and soldiers. The zone wedged between these checkpoints is home to four schools, two of which are exclusively for boys between the ages of 11 and 16. Technically this area is H2 and Israel is therefore, as the occupying power, obligated to protect not only the humanitarian needs of the Palestinians living in the area, but also to ensure their human rights and law enforcement. But on the other side of checkpoints 29 and 209 there is no Israeli military or police presence. The military emerge only at the onset of a clash. At that point, soldiers move down the respective streets from the checkpoints into this no man’s land. At any other time, there is no law and order, very little control, and extensive tension. In this calculated occupation, each action is carefully considered and implemented. The location of checkpoints 209 and 29 and lack of authoritative presence in this volatile zone is clearly strategic. Behind the checkpoints are several Israeli settlements and the shared Ibrahimi Mosque / Tomb of the Patriarchs. 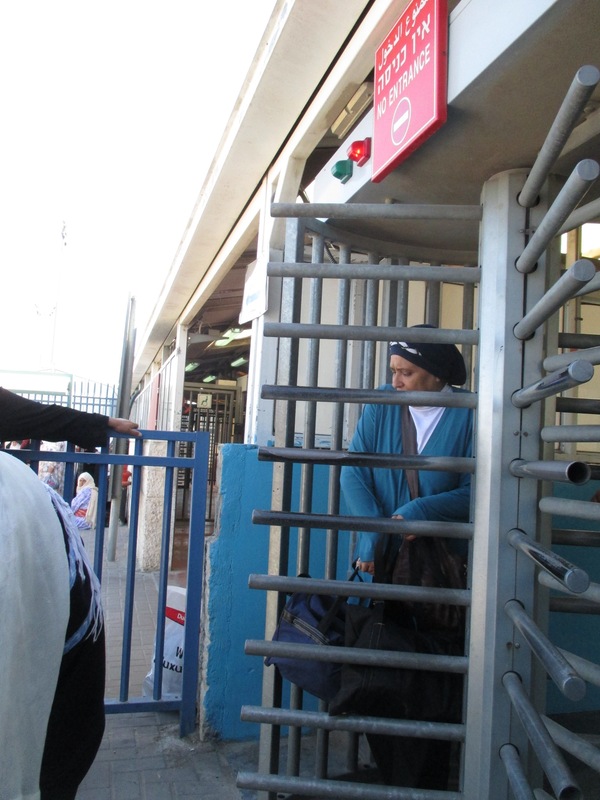 The checkpoints allow secure and controlled access to these sites for Israelis and link the settlements. It is not beneficial to the Israeli military to go beyond these checkpoints even though the area is H2 and Israel is required to protect and monitor the people and the place. This absence further fuels the tension. The existence of checkpoints 29 and 209 create a sense of imprisonment. Metal detectors, turnstiles, and armed soldiers control who goes where and when. The restrictions on the natural movement of the Palestinian people socially suffocate normality and reinforce the reality of the occupation. This breeds frustration and fuels the clashes. Palestinians and soldiers are responsible for provocation and violence; when Palestinians throw stones they encourage the soldiers to move away from the checkpoint. 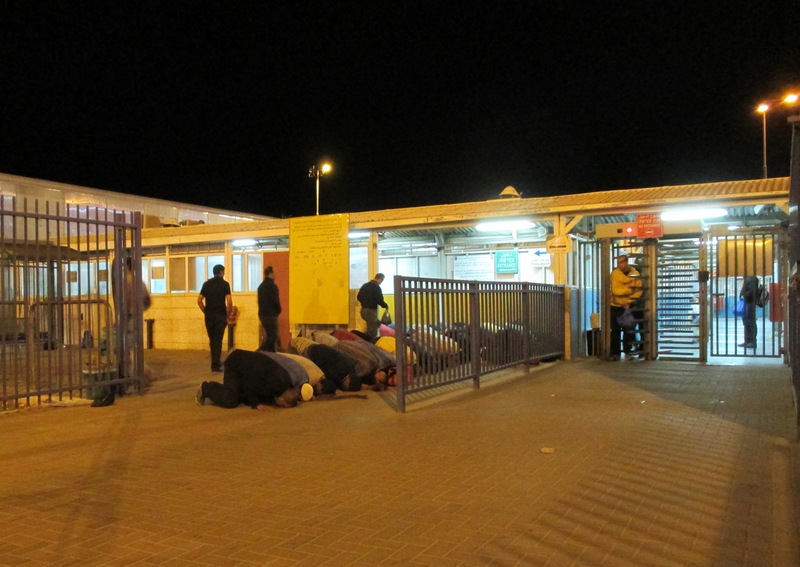 And the checkpoint itself provokes the Palestinians to throw stones in the first place. The only civil and military authority allowed on both sides of the checkpoints is the Israeli authority as Palestinian authorities are not allowed to enter H2. Israeli police, responsible for civil security in the occupied territories, are not present beyond checkpoints 209 and 29 thus leaving an open space for crime and unrest. Clashes are a form of resistance led by teenage boys searching as a way to express their unhappiness and frustration with the occupation. Stone throwing has developed into a symbol of struggle and a demonstration of dissatisfaction all over the occupied Palestinian territory, but in this area it has become an almost every day occurrence. Where Palestinian law enforcement is prevented from acting as a civil authority, the Israeli police are not present to fill that gap. Teachers and residents are left with the responsibility to act as the societal authority in an attempt to restore order and achieve a school day in an extremely volatile situation. Right before school begins in the morning, teachers and residents take to the streets in an attempt to dissipate the boy’s intentions, bring them into the classrooms before the first stone is thrown. Sometimes teachers succeed, but sometimes tension escalates too fast, a stone flies and the violent unequal force demonstration begins. A teacher in one of the schools explained that the main problem is the Israeli soldiers approaching the entrance of the schools and he believes the clashes could be avoided if the army stayed behind the checkpoints. Several times, during the last month, Palestinian teachers were on total or partial strikes, requesting better working conditions and salaries, a scenario that replicates the educational situation in many countries in the world. 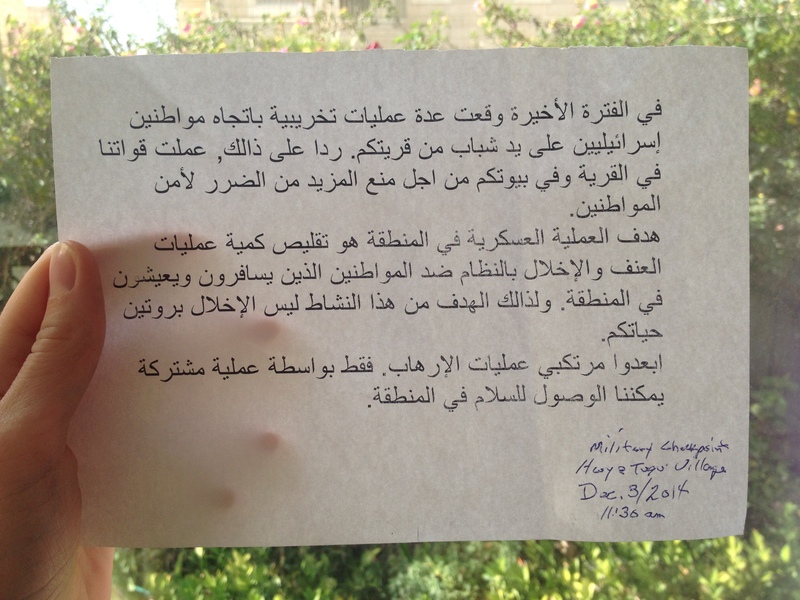 Negotiations between the teachers’ union and the Palestinian Authority occur during afternoons leaving no time to communicate to the students that schools will be closed. 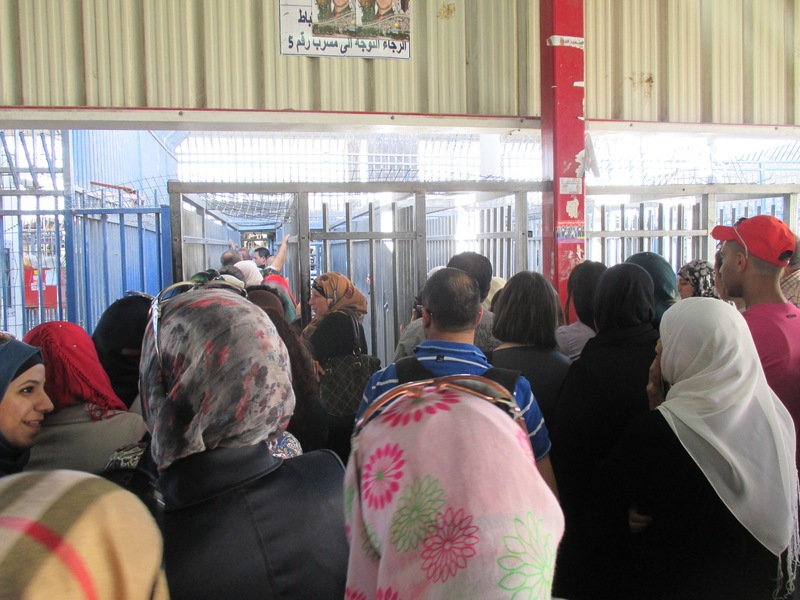 Unlike most countries, in Palestine, particularly in Hebron, a teacher’s strike has two consequences: a lost school day and unbounded tension in the vicinity of the checkpoints. Clashes never result in a winner. Neither the soldiers nor the boys gain territory, power, control, or respect. But they continue, in the same manner, with the same result. A tipping point is inevitable but what that tipping point may be remains a mystery.